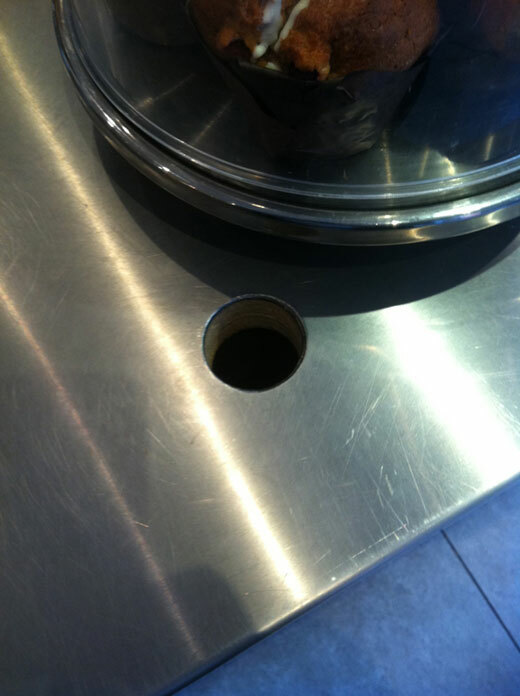 The example shown above is a perfectly round hole cut through a serving bench at a local café. The hole was evidently intended to convey the cash register's cables into the joinery, but times have changed, and the register has been moved 400 millimetres to the left, making the hole superfluous. I find this hole fascinating. It is so carefully made, and so materially satisfying - there is something delicious about a nice, even hole cut through laminated materials. The edge of the hole as it passes through the stainless steel skin has been filed smooth, and the ply substrate is visible beneath, with its tooled striations. Nevertheless, this particular hole is currently useless. One can take all manner of lessons from the position of this hole, and pontificate about the unwise nature of some decision-making processes in detailed design, but really, who cares? Perhaps, as the hippies did to the barrels of the guns, we should put a flower in the hole. Then again, perhaps not. Ultimately, the world has another hole in it: all is well.